Today's post about the joint aquarium Fiji expedition comes from the Aquarium's curator of fishes Steve Bailey. Photos by Keith Ellenbogen, Bailey and Dr. Stacey Jupiter, Wildlife Conservation Society's Fiji Country Program Director. 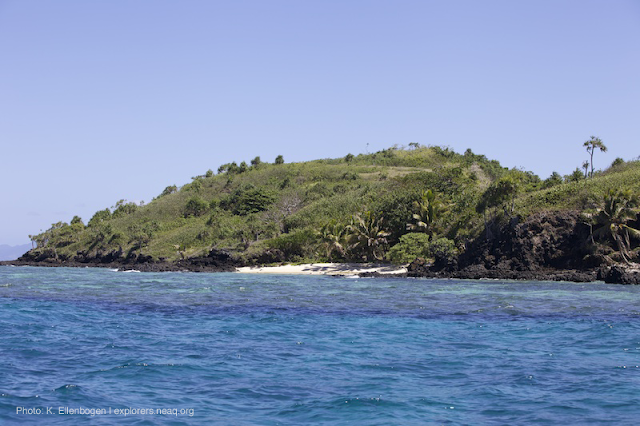 Visiting the bird sanctuary on Vatu-I-Ra is always an expedition highlight for the Fiji team, as there’s nothing like seeing first-hand how a protected area can play such an important role in supporting healthy oceanic bird populations. Each of the first six Fiji expeditions have landed the NAI’A’s skiffs, noted species seen, shot thousands of photos, collected the inevitable water borne rubbish that’s come ashore with the rise and fall of the tides and the steadily pushing hand of the wind and left feeling really great about sacrificing a dive for some land trekking and exploration. But this year’s expedition participants would be all in for continuing our theme of embracing as much unexplored territory and untried experiences as possible; naturally that’d mean we’d try going ashore on Vatu-I-Cake (pronounced va’too ee thock’ay), an island that we’ve never dived, let alone set foot. Fiji has 332 islands, more or less, and likely noticeably less these days given global climate change’s rising sea level’s relentless smothering of the Pacific’s low lying islands and atolls. Not having had prior contact with Vatu-I-Cake during the prior expeditions isn’t surprising, as our presence in the Bligh Water and amongst the Lomaiviti islands group has always been a question of carefully and somewhat regrettably choosing a handful of dive sites to strategically fill ten days when there’s likely enough worthy sites in this region to fill 110 days. 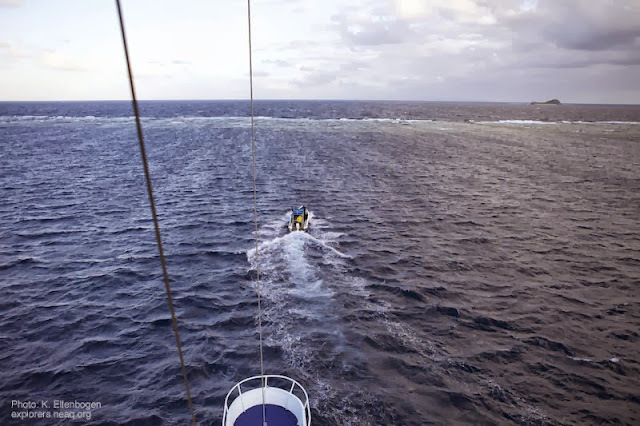 As we approach Vatu-I-Cake, it appears to be nearly a mirror image of the familiar northwestern sister Vatu-I-Ra: no human habitation, thick vegetation, a sandy beach on the south side, rocky peaks, and relative isolation. 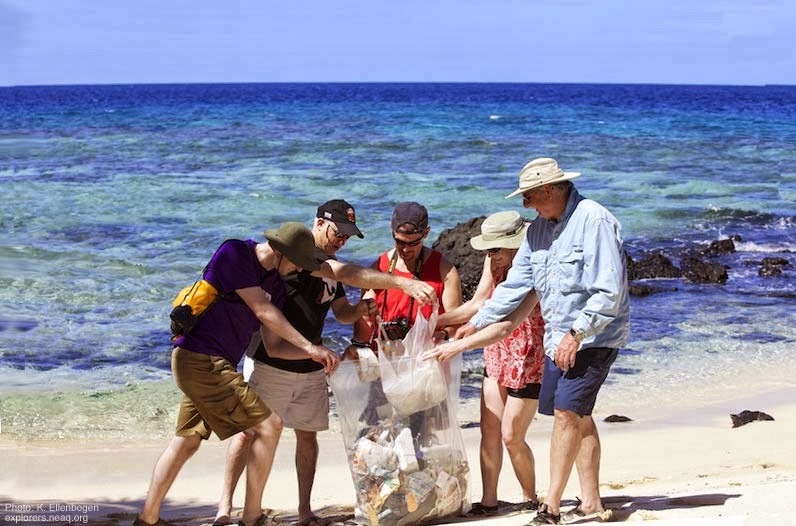 Those amongst us who know the plight of oceanic birds are hopeful that this time ashore will put big grins on our faces, and we’ll have that warm fuzzy feeling that comes from doing some cheerful service [aka rubbish detail] that we’ve done for years on Vatu-I-Ra. 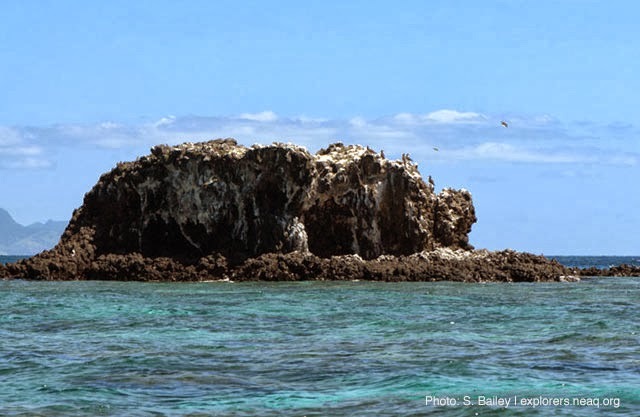 Upon closer inspection, Vatu-I-Cake’s north side reveals some birds clustered on an offshore naked rock promontory, but no visible circling or landing birds in the island’s shrubbery and trees. 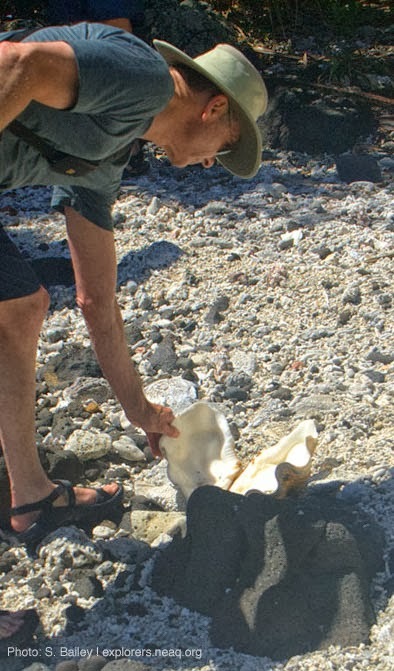 Curiously, we also see large bleached tridacna (giant clam) shells propped upright on bluffs and ledges; palpable negative energy emanating from those, in my opinion. 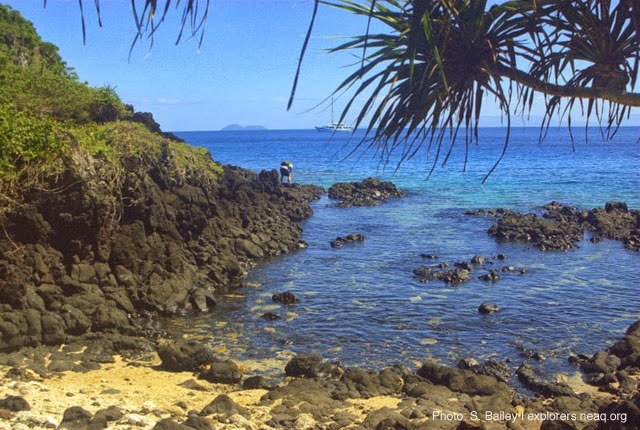 Our entry on this side’s small beach is dotted with numerous shallow volcanic boulders, and a lower tide than we’d prefer. Anxious to get to exploring we all carefully exit the skiffs in short order, cameras—binoculars, rubbish bags in hand—and some hope that the other side of the island has something different happening. Quick assessment reveals gobs of plastic water bottles and containers, used food tins, campfire remains of varied histories, a hastily constructed palm thatch hut, and hundreds(!?) of tridacna shells scraped clean. Many of us exchanged sighs and utterances not fit to print. 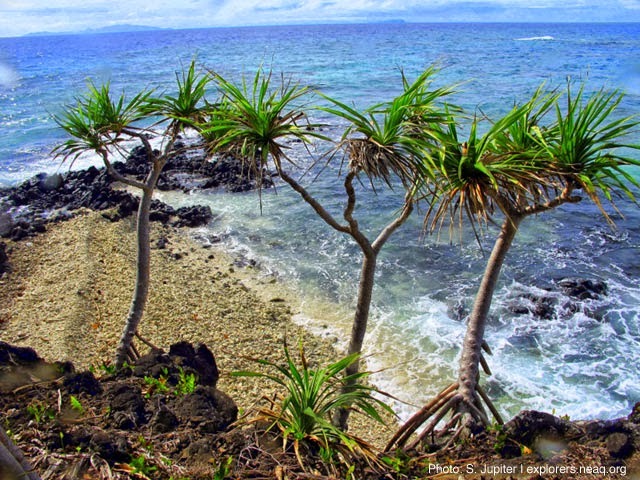 We hiked on an old path lying between the island’s peaks to the other side and were greeted by a low swell rolling in on a blindingly white coral sand beach, black volcanic tide pools, and rustling palms. Our survey of the navigable stretch of shore and lowlands beneath the steep cliffs revealed heaps of rubbish, some long ago crumbled stone foundations, tridacna shells beyond counting, and no visible clusters of bird nests. 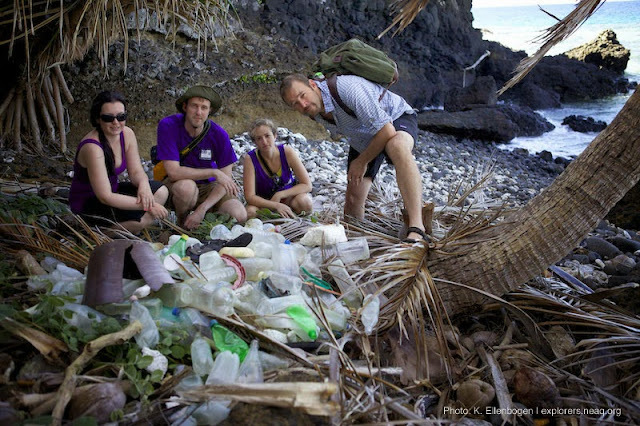 Within 10 minutes the Fiji Aquarium Team filled its rubbish bags and continued to make piles of everything that didn’t belong there. From a distance Vatu-I-Cake looks to be like its northwestern twin, a beautiful island, a good candidate for birds to use for furthering their lines and mighty inviting for humans to use. Well, on closer inspection it looks like it hit on two of three and, unfortunately and unlike Vatu-I-Ra, this island isn’t held in high regard and treated with respect. How does that translate for the big picture? Conclusion has to be: the island certainly isn’t being allowed to maximize its role in the local and distant ecosystem’s wellbeing. Sobering for us all; Fiji is a paradise, but no paradise is ever perfect. I contacted our good friend Dr. Stacy Jupiter, WCS Fiji Office Director and veteran of two Joint Aquarium Fiji Expeditions, for some impressions and any background she might provide on Vatu-I-Cake. Surprising, Dr. J had just been to the island for the first time only a few days before our landing. “I’d guess the island does have rats [likely Rattus exulans], but don’t know for sure.” If there are rats predating bird eggs, likely that’s a big part of why the island can’t currently support a bird colony. 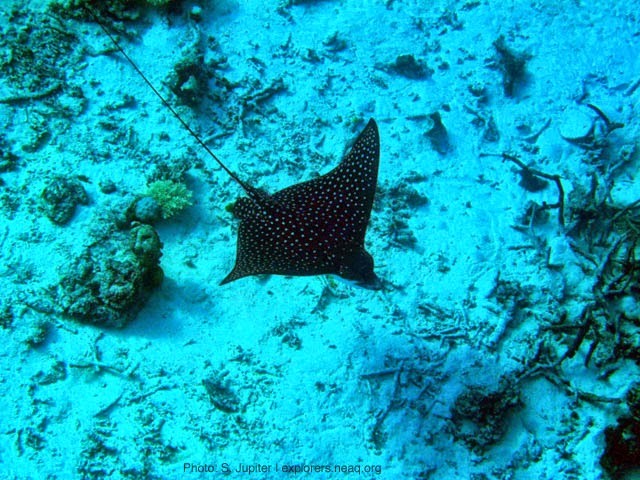 Stacy goes on to mention that during her visit she snorkeled about Vatu-I-Cake’s reefs and had the thrill of spending 20 minutes with four eagle rays (Aeobatus narinari), and saw very healthy coral stands. 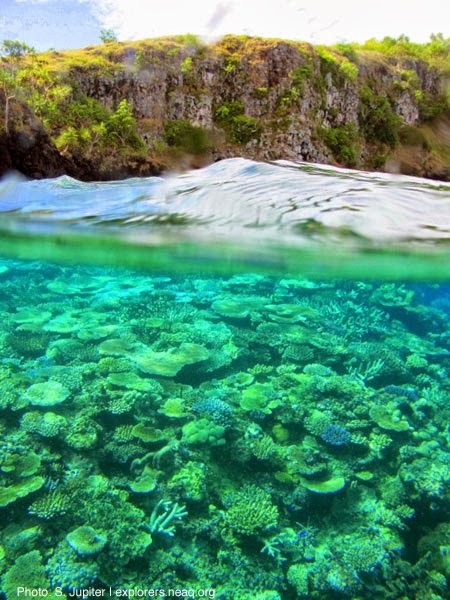 She hopes to have WCS successfully work with the Vuya District leadership to develop a ridge-to-reef management plan. If successful, Dr. J may be on the path to effecting something of a turnaround for Vatu-I-Cake above water. Listen to Dr. Jupiter on this AM’s Radio Australia interview about her work in Fiji on locally managed marine protected areas.